Almost ten years ago the Brazilian band Osmium morphed in to what would become Daydream XI. After a single EP, it took until 2014 before there was a real debut album; The Grand Disguise. Now the successor sees the light, a conceptual album that takes you on a metaphorical journey, where the circus master takes his new apprentice across the various acts of this circus. Each song represents a feeling or aspect of human life, channelled by the storyline of each character. Although Daydream XI 's line up is a stable one, a minor change came when bass player Tomás Gonzaga left after the debut, leaving vocalist and guitarist Tiago Masseti, guitarist Marcelo Pereira and drummer Bruno Giordano as the core of the band. The bass parts on The Circus Of The Tattered And Torn are performed by Benhur Lima and the keyboard are played by Joey Izzo. 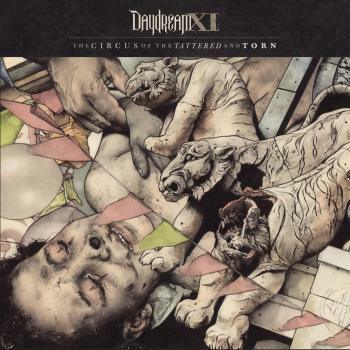 The Circus Of The Tattered And Torn is an album that blends hard rock with progressive metal and power metal parts and musically should find its way somewhere in the line of Symphony X and DGM. After a spoken word intro, Ticket 000011 which can be seen as the interlude to the upcoming story, Open The Curtains kicks in as a powerful, though bombastic track. Excellent variation on the guitar parts, a cool soaring keyboard underneath and tough, to the point drums. Tiago's vocals are very pleasant to listen to, completing a solid adventurous track. The fine riffs continue when Trust-Forged Knife follows; a track that combines powerful passages with more vocal laden emotional parts. The nice keyboard solo add the progressive touch in the double bass oriented tune. Hints of Avantasia are added when the close to seven minutes lasting Painted Smile passes. A nice bombastic track loaded with nice guitar solos from both guitarists and well dosed choir parts on the back. A short ballad; Windblown bridges the gap between two heavier compositions. A Cup Of Agony might be the heaviest track on the album, perfectly displaying massive riffs and epic vocals alongside seemingly easy played complex drum rhythms. One of my favourites on the album is the epic; Overhauling Wounds, a progressive composition that is nicely built, blending smooth piano parts with tense vocals and varied guitars. I guess the most intense, expressive composition on The Circus Of The Tattered And Torn is Collector Of Souls. I only can describe the song as a progressive gospel song with a lot of bluesy and classic rock elements. An outsider? Totally, but it fits like glove to the rest of the songs. After this heavenly track, another very strong composition awaits, Forgettable is like previous heavier track a very pleasant experience to listen to. A second ballad brings balance to the songs, The Love That Never Was again is intense, vocal wise; a fine orchestrated, acoustically composition. If you take all the aforementioned tracks and melt them to one solid composition, multiply by two and you get the amazing finale of the album. The title track The Circus Of The Tattered And Torn , clocks over fifteen minutes of power, emotion and solid craftsmanship. A real must for all progressive rock and metal fans. Since I wasn't familiar with the previous album of Daydream XI, I count it my loss. The 2017 release The Circus Of The Tattered And Torn is a stunning piece of art, that impressed. Highly recommended.